With one second left and the Panthers up 2-1, Filip Forsberg (on the fifth anniversary of this, look away Caps fans) appeared to put home a loose puck and tie the game up. The officials on the ice called it a good goal, but the Situation Room in Toronto called for a video review. At question? 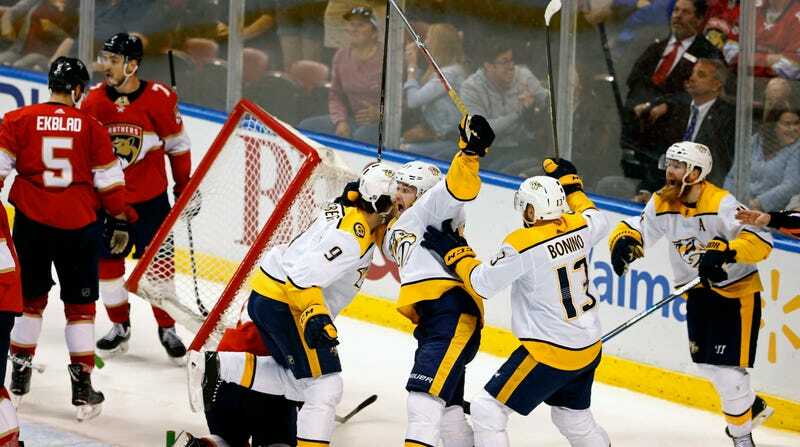 Whether any Nashville skaters had interfered with Florida goalie Roberto Luongo. Sit through this entire six minute video if you want to experience all the thrills of endless review—coming soon, the NHL doesn’t hope, to a playoff game near you! Rule 69.1 (2) states that goals should be disallowed if “an attacking player initiates intentional or deliberate contact with a goalkeeper, inside or outside of his goal. Oh, man, I disagree. Luongo did not know where the puck was, looking behind him even as it was shielded (but not smothered) by his equipment. Viktor Arvidsson in front saw it and poked it to knock it free, and Forsberg finished it off. Did Arvidsson make contact with Luongo? Yes. Does it matter that he was being jostled by Keith Yandle? Apparently not. Would Luongo have been in position to stop Forsberg without the contact? Definitely not. 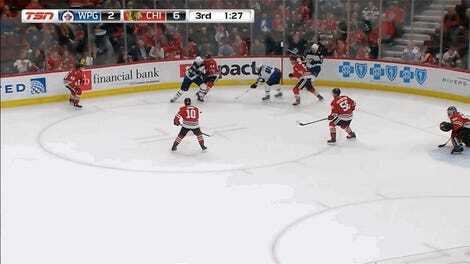 Did any replay show conclusively that the puck was ever? Absolutely not. We’ve gone through this so many times this season, but the goalie interference rule is heinously complicated and the process for reviewing it is seriously flawed. Players and coaches say they could live with a rule they don’t love if there were only some consistency in how it’s applied. Instead it feels like a total crapshoot. The fear is that an iffy goaltender interference in a crucial moment could derail a playoff game, and maybe even a series. That’s be an awful thing for fans and for the league, to say nothing of the team on the wrong end of it. And all I can say to be optimistic is ... we’ve been lucky enough not to have an offside review challenge ruin a playoff game, so maybe we’ll get lucky with this? Not very comforting, I know. Even this regular-season instance may potentially have major consequences. With the loss, Nashville is only three points up on Winnipeg for both the Central Division crown and the best record in the West. Meanwhile, the Panthers, through 79 games and with a game in hand, are four points back of the Flyers and five back of the Devils in the wild card race. Can I Bribe You With A Beautiful Goal To Get You To Read A Short Blog About The Capitals&apos; Playoff Chances?